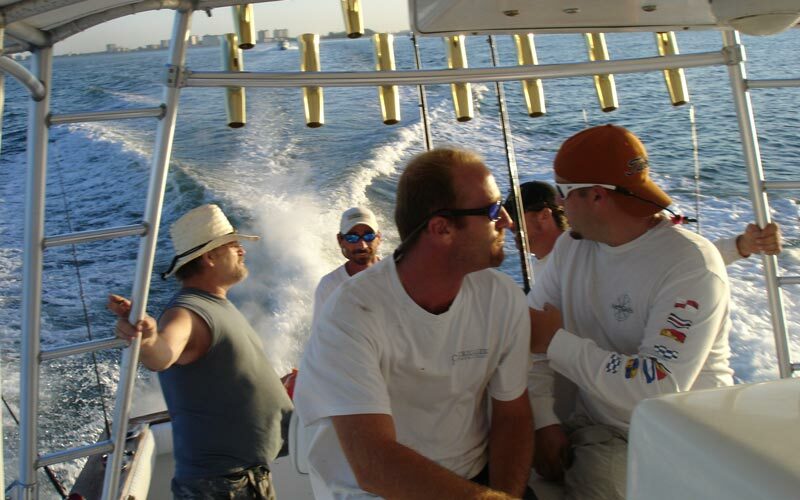 Outriggers is an offshore charter fishing operation out of downtown Sarasota, Florida. We package the boat in various hourly rates and would be glad to customize any trip our customer would desire. Whether you are targeting Trophy Fish for mounting or filling the icebox, your goal becomes ours. Captain Ryan the last 15 years has split his time between charter fishing and commercial fishing. This experience is absolutely necessary for any serious fisherman. The combination of his commercial background and customer pleasing desire makes any trip aboard outriggers an experience of a lifetime. Year round, Outriggers specializes in stand-up bottom fishing focusing on Grouper, Snapper and Amber Jack. Seasonally, we offer charters focused on night fishing for Trophy Sharks, and numerous day trips for migratory pelagic such as Dolphin, Cobia, King Mackerel, and Black Fin tuna. Everything needed to fish offshore is included except for food, beverage, and sunscreen. Sun protection is vitally important; we strongly recommend sunscreen and sun glasses. Motion sickness for some is a bi-product of boating, motion sickness pills for many are a great idea – the prescription patch has seemed to work the best. Our boat is a custom built Carolina sport fish with the latest Furuno electronics package. As far as gear and tackle is concerned we have spent years upgrading and researching various techniques to make the fishing experience unforgettable. We allow our customers to bring their own tackle, but recommend them to use ours. Our equipment is specifically developed for the fishing we do! Offshore Sarasota opens up a world of possibilities for any type of fishing experience. We can custom make a trip for the expert fisherman or design a trip for the inexperienced. Customer satisfaction is the main desire of Outriggers. Ryan was born and raised in Ohio. Ryan told his mother at a young age he was going to be a fisherman in Florida. As a child he spent every free moment fishing in ponds and lakes to always better his skills and learn new techniques. As soon as he turned 18 he packed up his gear and moved to Florida to pursue his dream as a Charter Captain. Once in Florida worked many of odd jobs before finally landing a job on the Flying Fish as a first mate. He quickly moved up the ranks and became a captain in 1998. Since then Ryan has upgraded his Captain’s license to a 100 Ton Masters. In 2004 an opportunity opened for Ryan found Outriggers sports fishing charters and Ryan has put everything into the business ever since. Kelleigh was a bartender and was working part-time as a mate on a charter fishing boat. She met Ryan while working together on a multi-boat charter. When they met they hit it off right away. The bond they share for fishing, boating, and just being on the water is why they’re known as the First Couple of Charter Fishing in Sarasota. Kelleigh does all the behind scenes work for the company. They now have two boys who both share their love for fishing. Rylee their oldest and Morgan the youngest enjoy every moment on the water and always follow in their parent’s footsteps. As a family, the Rolland’s share the same passion and love for fishing, and enjoy showing and teaching others. Tom was born in a small farm town in Pennsylvania and moved to FL in 1990. Tom met Ryan in 1995. They started fishing together on piers, bridges, and charter boats. Tom was invited on Captain Ryan’s commercial fishing trips and this is where Tom found his passion for fishing. Since then Ryan and Tom have been working together in commercial, charter, and party boat fishing expeditions. Tom is self-taught and also very experienced in taking care of all the tackle plus repairing rods and reels. Tom has earned his Captain’s license and is a big part of the crew and the Rolland family.